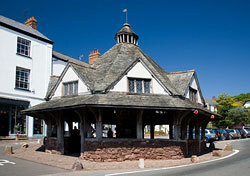 Dunster is a picturesque village located on the fringes of Exmoor. 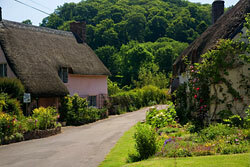 Characterised by thatched cottages, a unique octagonal yarn market and the romantic, turreted, Dunster Castle, the village is steeped in history and contains in the region of two hundred listed buildings. Once a thriving port known as Dunster Haven, when the sea retreated leaving the village high and dry, Dunster looked to the textile industry for its survival, quickly becoming an important wool trading centre. A unique, octagonal yarn market was built by the Luttrell family in the early 17th century and the villagers even began producing their very own yarn, called 'Dunsters, renowned for its strength and quality. 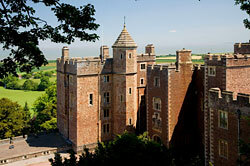 For centuries the Luttrell family made their home in Dunster Castle, which is situated high on a steep hill overlooking the village, with sweeping views of Exmoor and the Bristol Channel coast. There is evidence that this splendid location was used as some kind of a fortress since Saxon times, although most of the present building dates from the 17th century (apart from a 13th century Norman gatehouse) and was remodelled by the Victorians, who added the fairytale towers and turrets. The castle passed into the hands of the Luttrell family in 1379, who held on to it until 1976, when Lt Col. G.W.F. Luttrell gave it to the National Trust. Dunster Castle, which lies among steeply-terraced gardens with a stunning collection of rare plants and herbs as well as the national collection of strawberry trees, was one of the last Royalist strongholds in the West Country to fall during the civil war, housing a garrison that only surrendered after a 160-day siege. Encircling the castle and its gardens is a twenty-eight acre deer park, criss-crossed with footpaths and home to Dunster Mill, an 18th century mill built on the site of a much older, pre-Norman one. Now restored and in full working order, the mill is run as a private business with a shop selling home made mill flour, muesli and souvenirs and a riverside tearoom. 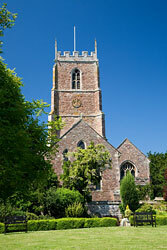 The tombs of the Luttrell family are contained in the Priory Church of St George, one of Somerset's most impressive parish churches. Re-built by monks in the 12th century, the church is virtually all that remains of a priory that was once an important arm of Bath Abbey. The oldest street in the village is West Street, although High Street, hardly short of historic interest itself, is now considered the centre. At the top is the iconic Yarn Market, which still bears visible scars from the English Civil War when a hole was made in the roof beams by a Palimentarian cannon ball. On the other side of the street sits The Luttrell Arms with its 15th century porch. Converted from a house to an inn during the 17th century, it was once owned by Cleeve Abbey, who used it as a guesthouse for visiting Abbots. 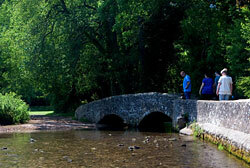 One of the few Exmoor villages that lies in the fertile valley of the River Avill (the inspiration for the famous hymn 'All Things Bright and Beautiful'), Dunster is surrounded by stunning landscape. A great way to view it is from the West Somerset Steam Railway which stops just outside the village and offers a ride through twenty glorious miles of Somerset scenery, taking in the Qunatocks, Exmoor and the coast.